You may all be wondering what's wrong with and why I would use a Galaxy Tab 2, but what you don't know is the power you can actually harness out of the tablet. It wasn't one of Samsung's greatest release, in fact a lot of people had trouble with the tablet because of it's slow responsiveness, force close of application because is had less then a 1GB of memory to operate and what not. The problems were numerous and people just didn't like the experience. Over the weekend I was talking with friends and members of Android Coliseum +Tom Gray and I sat myself goals. It's not like I had anything better to do during the day, trust me. 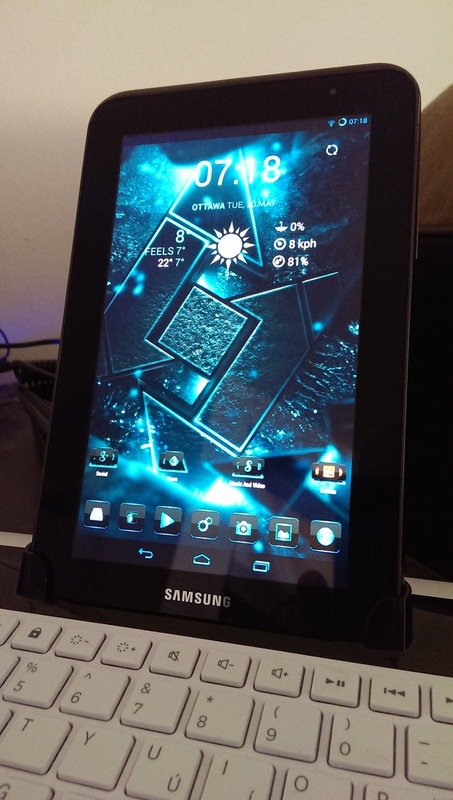 Can I get the Galaxy Tab 2 7.0 to operate like if it was my Nexus 2014 with it's slick smooth buttery feeling? First things, first, you need to have a recover (CWM, TWRP) installed, be rooted before any of this is possible. To answer that I had to change a few things about the tablet. First I had to find a ROM that would work and nothing but kitkat 4.4.2 would do it. Finding a descent ROM that would work like I wanted to was a bit of a daunting task as there's not that many choices. I trialed a few different ROM's before I made my pick. I had choices from OmniROM, PAC, CM11, CM Expresso, MOKEE etc. Figuring out what would work the best with a combined kernel I finally settled on CM11 with the AGNi kernel. Once that was done there was a few tweaks that needed to be put into place. Selecting the proper overclocked capacity which ended up being 1.2ghz because the higher ones would simply crash the tablet. I know that some of you may be able to get it to work at higher rate but it wasn't working on mine. When it came time to the kernel, I had tried 2 or 3 of them that are available on XDA but I had to settle for AGNi as it gave me the better options for what I wanted to do. Since it's already severely tweaked there wasn't a lot required from my part except play with the settings. I settled in the end to set the Lulzactiveq governor with the SIO. Now that this part was complete, I had to change the GPU to 384mhz as the "stock" setting was just not cutting it for the graphic processing. A few minor changes were completed and all possible with the AGNi kernel really helped the game. One of your best friend in here is RomToolbox, you'll be able to edit a few more options if you know how-to venture in that direction. If your interested to see what it looks like. I invite you to check my post on Google+.